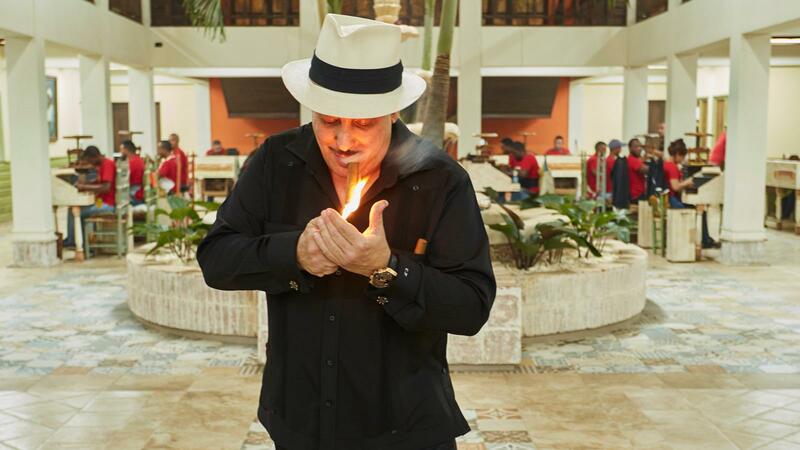 Carlos "Carlito" Fuente Jr. lights up in the courtyard of his new factory in the Dominican Republic. I’m still in a bit of awe. 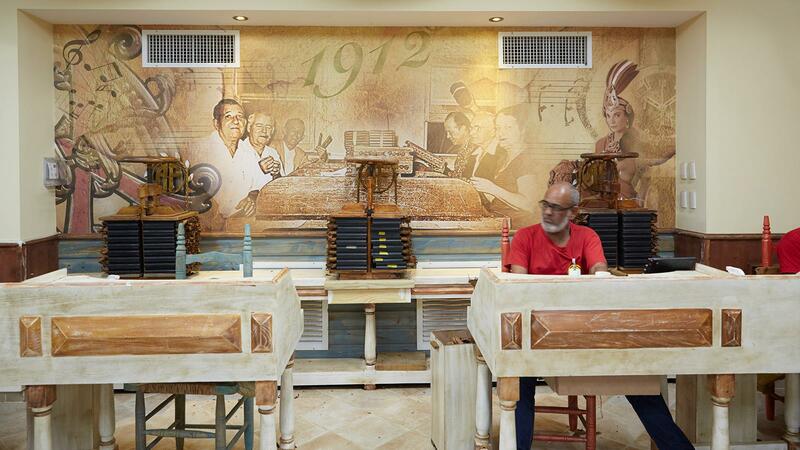 Carlos “Carlito” Fuente Jr. has expanded his cigar factory in the Dominican Republic. Expanded might be an understatement. He’s probably tripled the size, and if you ever visit, you’re going to need a map. It’s cavernous and cloistered and sometimes seems like a labyrinth. But, at the same time, it’s also grand and opulent. The crowning jewel of this expansion is its central rolling gallery, something Fuente calls the catedral de tabaco—cathedral of tobacco. Based on the historic Columbia Restaurant in Tampa, Florida, the gallery is a gorgeous, two-story space with a central courtyard and fountain in the middle. The rollers on the ground floor are situated under the arches of the courtyard’s perimeter. On the mezzanine level, the rollers overlook the fountain while a skylight adds to the airy affect. Carlito showed me the plans for this massive undertaking about three years ago. Now, it’s come to fruition. “There isn’t a square inch of this place that doesn’t symbolize something,” said Fuente on my visit. There are so many new corridors and hallways and wings that I didn’t recognize, all paved with decorative tiles flown in from Spain and Italy. 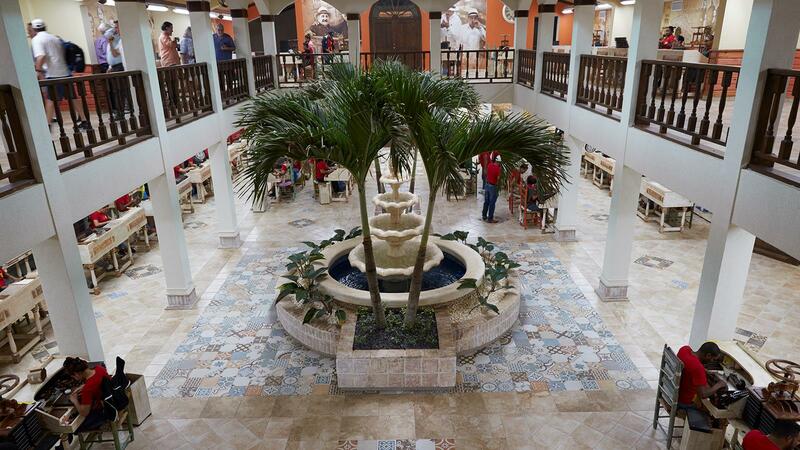 The two-story courtyard inside Fuente's new factory. Fuente’s factory is located in one of Santiago’s free-trade zones, which is an industrial park that allows cigar manufacturing for export only at a minimal tax rate. As part of his grand plan, he bought the building behind the factory. And the building to the left of it. And the building to the right of it. And he’s seamlessly bridged them all together. So many things have been rearranged. The stripping and sorting areas have been moved to a larger space. So has the packing room. The aging rooms have their own corridors. All core-line Fuentes are produced in the “cathedral,” which has its own lobby, antechamber and front entrance. The new Fuente factory features many new rolling rooms. 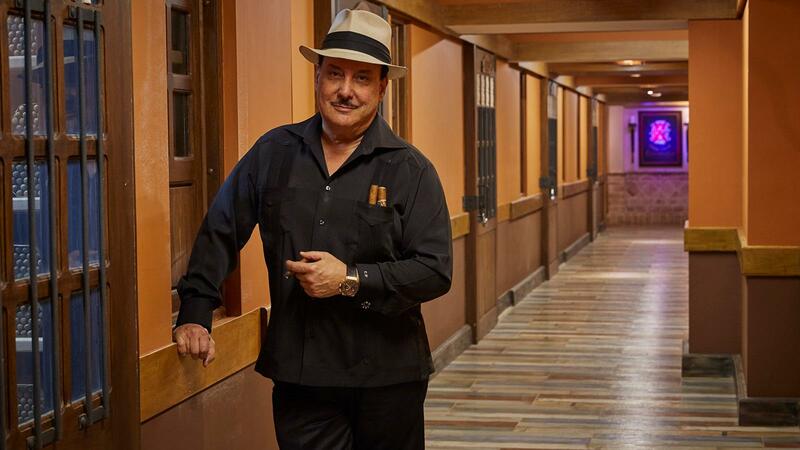 Production of the Don Carlos brand has been temporarily diverted to other rolling sections until the new Don Carlos room is complete. The room is a tribute to the brand and right next to it, Fuente is building a casita, which means a cottage, or little house. It’s a replica of the house he grew up in in Tampa. Not quite sure what he plans to do with that. Even though he’s created so many new rolling stations, he’s not really expanding production in any significant way. The whole operation seems to be a tribute to his father, and a giant shrine to his heritage and to his entire family history. Despite all the changes, some things are staying the same. The aging rooms for both Don Carlos and Fuente Fuente OpusX are not being touched. Neither is the OpusX rolling room. “That was not negotiable,” insisted Fuente. Other rolling rooms are also staying. The Hemingway Room, where the Hemingway brand cigars are rolled, isn’t being touched either. Nor is the room where Don Carlos Eye of the Sharks are made, our 2017 Cigar of the Year. Only two people make that size, regardless of the high demand. Much of the factory still isn’t finished, but Fuente anticipates completion by the end of the year. Fuente Jr. says that the new factory should be completed by year's end. “I have so many plans. I’m going to see about giving different brands their own aging rooms. That way I can micromanage the aging of every cigar,” Fuente told me. He’s very excited, and who could blame him, but he was also very precise in his vision. As to how much it cost him to do this, I’m not even sure Fuente knows. He only answered with a laugh and a shake of his head.